There’s a lot to consider before purchasing a patio for your property. They come in all shapes and sizes and can be designed for several different purposes that may or may not suit your needs. Whether you’d like a patio that features a large garden or one that compliments a swimming pool, it’s optimal to know exactly what you’d like so you’re pleased with the finished product. Shade from the sun is key. If possible, place the patio on the shady side of your home or under a large tree. If neither is possible, there are artificial options like an awning. Natural Airflow such as a cool summer breeze can take a relaxing afternoon to the next level. Try to build your patio away from a large feature that would obstruct the airflow. Noise Pollution can ruin a tranquil afternoon in the shade. Try to avoid installing your patio near loud parts of your home such as the laundry room. Space available on your property is important for two reasons: sizing your patio and making sure the finished product can maximize the available area and make it appear larger. Protection from inclement weather is especially important if the patio is planned with outdoor furniture and other set pieces. Making sure there is a contingency plan for such events will help prevent damage. Outline the planned space with string and batter boards so you can visualize it and confirm the area you’d like to be used. Excavate the planned space to an uneven level at first.This is because patios must slope from the building, a 1-inch drop every 4 feet. This is so rain flows away from the home and does not collect against the wall. Install lights to your patio to make the area pop more during the evenings. An optional addition, but still the best time in the process to install a lighting system. Then lay the base of gravel, sand, and other sediments in order to create a level platform for the top layer. Two Decisions to make isfirst deciding the material for the surface layer. This includes bricks, pavers, concrete, and other options. After you decide on the surface martial, you’ll then have to choose the style you’d like the material to be set in; this includes common styles like jack on jack and running bond. Finishing touches include adding jointing sand and wet the patio to cure and hold over the next 24 hours. Add add in the border stones to define further define the patio on your property. There are several different options to further complement your newly developed patio. We offer an array of additional hardscaping and softscaping services like firepits, gardens, ponds, pool decks, and more. There are many benefits to landscaping in general, like the increase in the value of your property and the improved aesthetic overview of your backyard. If you’re thinking about installing backyard features like a patio, talk to the experts at Greener Horizon. 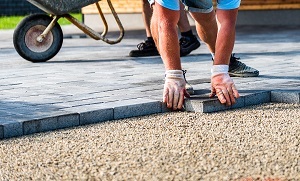 We can help you with all of your landscaping needs from big jobs like hardscaping and stonework to the little details of designing the perfect patio. We’d love to take a look at your property so request a consultation today!